Although winter is treating us quite well here at All Things Flooring so far, we know that the bitter months are yet to come, bringing with it frosty mornings and chilly afternoons. With central heating being a standard requirement in contemporary construction, and with the industry seeing an ever increasing focus on comfort, many developers are choosing underfloor heating (UFH) systems to meet the needs of both new-build and refurbishment projects. Underfloor heating is a system which achieves indoor climate control by circulating heated water within the flooring or by placing electric cables through a floor medium, such as screed, which in turn transfers radiant energy (heat) to create an ambient room condition. Although this principle has been around since circa 500 B.C., advancements in technology, particularly with respect to UFH pipes and low temperature renewable sources, means that UFH can now be designed within the fabric of the building to provide an efficient and invisible heating system. What Types of UFH Systems Are There? While there are many different systems on the market, this section will focus on the most prevalent types. Pipe in-screed systems are the most popular choice in today’s UFH market. 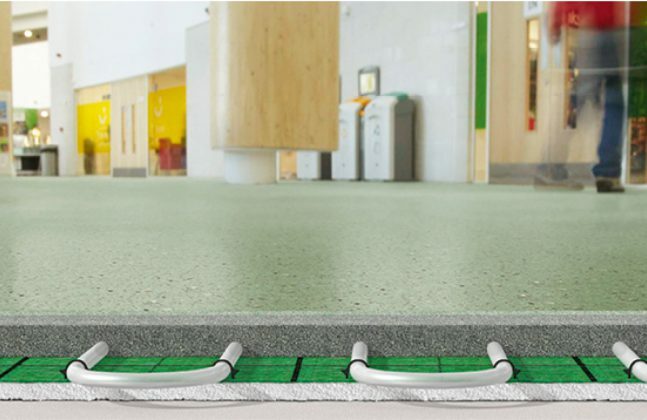 The installation will result in a high standard or normal standard surface regularity (SR2 or SR1) tolerance, and depending on the screed type and floor covering used it can be fast acting and efficient. Surface regularity (SR tolerance) is important in respect to the quality of a screed or floor surface and is often described as a measure of waviness of the surface. The SR of screeds for normal accuracy floors are measured based on the deviation from a straightedge laid flat on the surface. 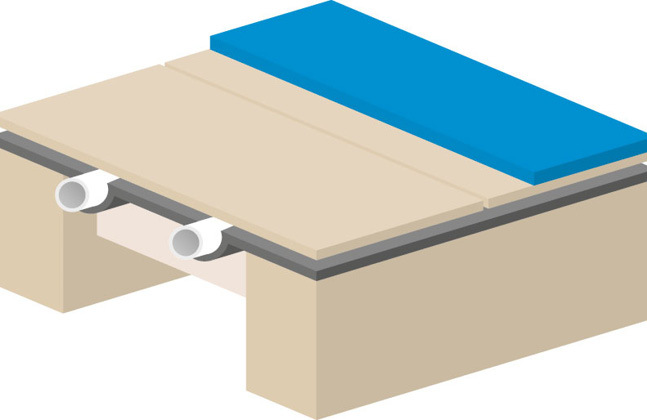 A typical ground floor section would include 50mm of Expanded Polystyrene (EPS) insulation with separating membrane, 16mm or 20mm UFH pipes and 65-75mm of screed. A main benefit of this type of system is the speed of installation, as the pipes are easily clipped directly onto the insulation. Once installed, quick drying screed options are available that use additives to produce an early drying, high strength screed, rather than the traditional sand and cement formula. Where a levelling screed cannot be incorporated, such as an upper floor that does not have a load bearing capacity, then a “dry fit” system can be utilised. Where as around 100-150 m2 of “in-screed” systems can be installed per day, typically 50-80 m2 of “dry fit” systems can be installed in the same amount of time. Whilst having no screed to cure can be advantageous, the floor contractor will still need to install the floor very quickly after the UFH has been installed, as the UFH system should not be left exposed to site conditions. Finally, electric UFH Systems have evolved over the years into efficient, fast responding systems. A fast reaction time combined with an extremely low profile makes electric UFH a great choice for wet rooms and single zone renovations. 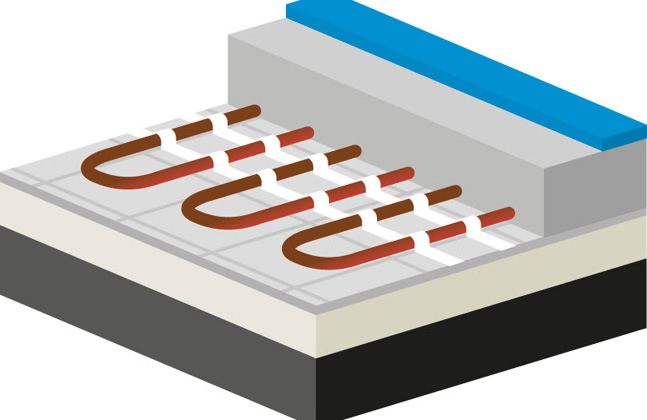 Here, the installation involves either a cable clipped to insulation (in a manner virtually identical to the in-screed method) or a mat with prefixed cables that is laid to the full heated area. The main difference with this method is that there is no distribution manifold, as the circuits are powered through a thermostat. Rates of installation vary from 50-150 m2 per day depending on the system and site conditions. Where Can UFH Be Installed? In short, UFH can be installed almost anywhere thanks to the development of low profile systems. 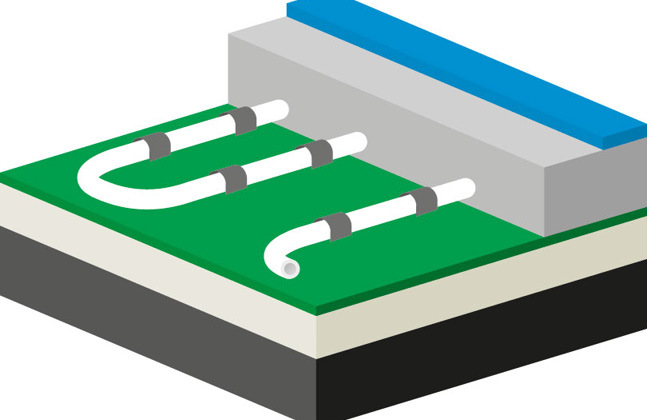 For example, depending on the insulation and acoustic requirements, it is possible to install the pipes of an UFH system on a castellated board in conjunction with a pump applied, self-smoothing floor screed at a nominal 40-50mm build up. Thanks to its ability to deliver on both comfort and efficiency, UFH is the fastest growing sector within the heating industry. Once you have chosen the correct UFH system for your facility, you then need to specify the suitable screed types. Join us in our next post where we talk through screed, temperature and extra measures to take to avoid floor failure.